The lining is one of the most important parts of your chimney. Relining or getting a new flue is caused by the old one deteriorating, which is hazardous to your chimney. The lining is what channels the heat and gases up through the chimney top and blocks the heat from causing the combustible material in the chimney to catch on fire. There are many types of chimney liners and one of our chimney experts can recommend the best one for your chimney. 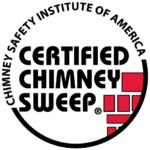 We offer this service to help your chimney be safe and efficient.